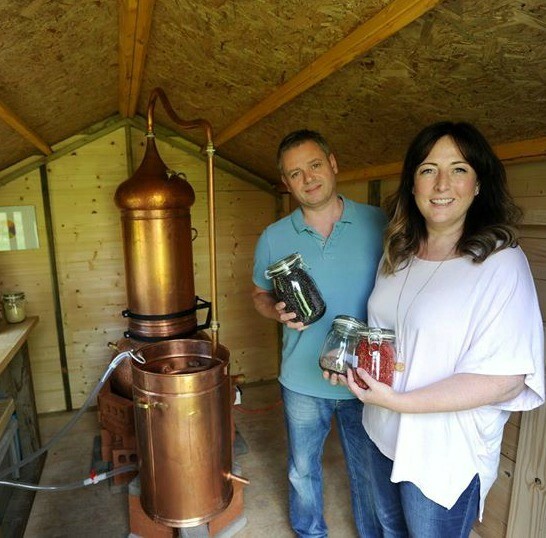 As we continue to bring you the stories behind some of Scottish Gin’s gin-producing couples, it’s lovely to share the story of entrepreneurial couple, Steve and Lynne Duthie who launched Esker Gin in 2016 from their garden shed in Cults, Aberdeen. While the garden shed was a great start for the gin brand, by the summer of 2016 Esker Gin was so popular that they had to search for new premises, and in early 2017 the distillery moved to the Kincardine Estate, the home of the silver birch sap that is a key botanical in Esker. The multi-award winning Esker Gin is now produced in the family-owned distillery located on the highland estate on Royal Deeside Scotland. We asked Lynne about their gin journey as a couple.